The National Archives Building was designed by the renowned architect John Russell Pope (1874–1937) as a temple to history. Pope, who also designed the Jefferson Memorial, wanted the architecture of the National Archives to reflect the significance, security, and permanence of the records held therein. The majestic domed ceiling of the Rotunda, rising 70 feet above the floor, and the 40-foot-tall bronze doors contribute to the feelings of awe and reverence experienced by visitors to this magnificent space. Learn more about the building. 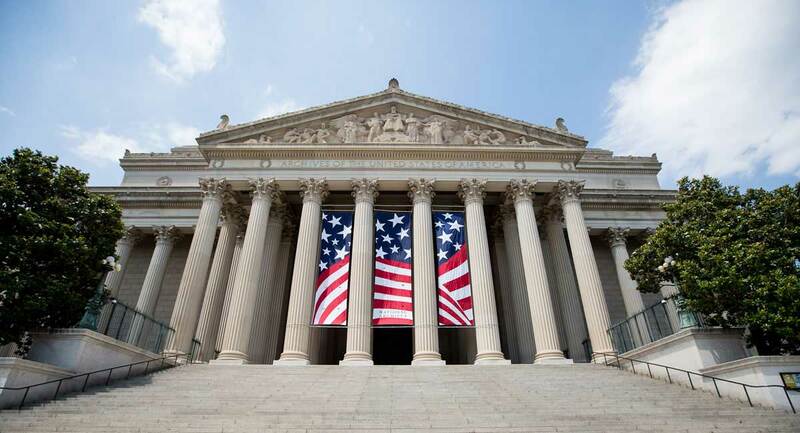 The National Archives and Records Administration is an independent Federal agency that preserves and shares with the public records that trace the story of our nation, government, and the American people. From the Declaration of Independence to accounts of ordinary Americans, the holdings of the National Archives directly touch the lives of millions of people. The National Archives carries out its mission through a nationwide network of archives, records centers, and Presidential libraries, and online. Learn more about the National Archives and Records Administration. The National Archives Foundation is an independent nonprofit that increases public awareness of the National Archives, inspires a deeper appreciation of our country’s heritage, and encourages citizen engagement in our democracy. As the National Archives’ nonprofit partner, the Foundation generates financial and creative support for National Archives exhibitions, public programs, and educational initiatives, introducing America’s records to people around the U.S. and the world. The Foundation’s support makes possible the National Archives Museum in Washington, DC. Learn more about the Foundation. The National Archives Store plays a vital role in fulfilling the mission of the National Archives Foundation by providing quality products and publications based on the holdings of the National Archives. Extend your educational journey at home and at school with products developed especially for the Foundation. Proceeds support the National Archives Museum and educational programming at the Archives.